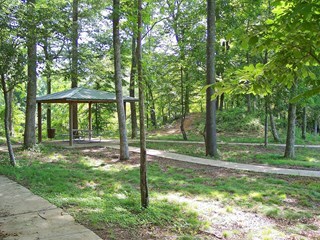 This historical site is also an official stop on the Alabama Birding Trail. The earliest road into the Marion region was Gaines’ Trace built between 1807 and 1810 by Indian Agents and Federal Troops to connect Tennessee with the Tombigbee and the coastal Mobile, Alabama area. This road provided an early route of settlement and served as a boundary between Marion County and the Chickasaw Indians along the northwest corner of the county between 1818 and 1832. Branches of Gaines’ Trace extended from both Florence and the Huntsville-Moulton area in the Tennessee Valley to the first evolving community in early Marion County, the Cotton Gin Port settlement on the Tombigbee River near present day Amory, Mississippi. Tree blazings that marked this old road can still be found north and west of Hamilton within present county boundaries. The Gin Port destination of the road had been established as a community by the placement of a Cotton Gin by the US Government during President Jefferson’s first term. President Washington had requested the gin to reward the Chickasaw and Choctaw Indians for their support in the Revolutionary War; and to further “civilize” these southern tribes. Thus, as the first village in Marion County, Cotton Gin Port was designated as the county seat in 1818 by the Alabama Territorial Legislature in session at St. Stephens. The first Territorial Judge appointed to establish county government was John Dabney Terrell, Sr.; who traveled to the Gin Port in the winter of 1817-18 and established the officialdom of Marion County, Alabama. Strangely enough Marion’s first county seat is today a “ghost town” located near the town of Amory in the state of Mississippi. Marion County’s second seat of justice was located just north of present-day Columbus, Mississippi, at the home of Henry Greer in 1819. The site is on the lower Buttahatchee River near where it empties into the Tombigbee. Thus, in 1819-20 the community of Columbus (now Mississippi) became the first real town in Marion County, Alabama; and basically served as the Marion Court Town. However, before Marion’s first official post office could be established in 1820 the Federal Government determined the town was located on the Mississippi side of the Alabama state line, and designated Marion’s first projected official post office as Columbus, Mississippi. Indeed, the establishment of the present day Alabama state line with Mississippi in 1820-21 deprived Marion County of all its “Tombigbee bottoms”, making most of the county “hills and valleys’ of northwest Alabama. None-the-less, about the time the Alabama-Mississippi state line was officially confirmed, a significant new road was completed through the “heart” of the remaining county lands that would bring more settlers and a thriving commerce. This very influential focus of early Marion transportation was none other than General Andrew Jackson’s Military Road; extending from the vicinity of Nashville, Tennessee and Florence, Alabama directly through the center of 1821-24 Marion County for about 100 miles. The road passed through Russellville, and the future sites of Pikeville and Hamilton on its way to Columbus (now Mississippi); and thence in a fairly straight line to Madisonville and New Orleans, Louisiana. It was built as a strategic short cut from Nashville to New Orleans for military and mail connections and civilian travel. This very significant road of early Marion history had its beginning as an Indian trail and appears to have been roughly hacked out by several disbanded groups of General Andrew Jackson’s and General John Coffee’s troops returning from the Battle of New Orleans in the Spring of 1815. The road was certainly discussed and planned during the War of 1812 by Andrew Jackson and no doubt cleared to some extent as an existing Indian trail by some of Jackson’s troops sometime between 1813 and 1815. The road was clearly completed as a major “open road” thoroughfare between 1816 and 1820 according to government documents and correspondence. In 1820-21 when Marion County lost her Tombigbee lands to the State of Mississippi, Jackson’s so-called “Military Road” became the county’s “life blood”. Notably, the key location in the county at that time was the “Military Ford”, where Jackson’s Road crossed the Buttahatchee River. And it was to an early evolving community there, (1818-20) that the Marion County Court was moved, when evacuating the Tombigbee communities in the spring of 1821. Historical documentation indicates that the Military Ford became the first Marion Seat of Justice within present day Alabama. Court was held under large trees and in local homes at the Ford by the first Territorial and County Judge, John Dabney Terrell, Sr. A Court House was not planned for the Military Ford as a commission had been appointed by the Alabama Legislature to select the most centrally located site for a new Marion County seat in 1820-21. Marion County’s first official post office, called Marion, was established here in 1821. The Commission chosen site for the Marion Court would not be confirmed until mid-1821, upon the Military Road 7-8 miles south of the Ford. The site chosen would be named Pikeville, to honor the slain hero of the War of 1812, General Zebulon Pike. Pikeville would be surveyed in 1821, and have a court house built in 1822, but see little settlement, building or activity until 1823-24. Marion County’s first official post office established at the Military Ford in 1821 would be moved to Pikeville in 1824. Thus, Pikeville, as the selected and new permanent seat of justice for Marion County was destined to become the historical focus of the county in the antebellum period. However, unfortunately, Pikeville was located on a rather narrow and isolated ridge along the Military Road among rather poor lands. It would not attract many settlers or many nearby farming ventures. Pikevelle would never become more than a village as county seat for 60 years, containing no more than 15 business establishments and 20-30 homes at its zenith in 1860. The primary businesses around Pikeville from the 1820’s through the 1880’s, other than the county court, were tan yards or leather tanning and products such as shoes and saddles. Pikeville was also noted for beaver hat production and several good hotels/taverns and saloons. Pikeville society was ably led by Probate Judge John Dabney Terrell, Jr.; who mastered county politics and remained in office between the 1830’s and 1880’s. None-the-less, Pikeville’s village status led to rapid community dissipation when its viable central location, thus its usefulness as a county seat, was diminished. The formation of Lamar County from Marion and Fayette Counties in 1867-68 left no choice but to choose a more centrally located county town. Thereby, Pikeville rapidly became a “ghost town” after the court was removed in 1883. 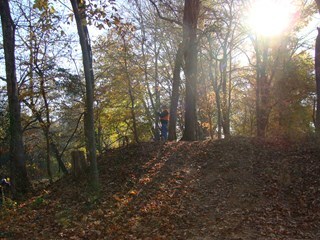 Today, Pikeville is a “must see” for history buffs, marked by ancient graveyards and store sites. One key two-story building yet stands there today from the antebellum period. It served as the home of Judge John Dabney Terrell, Jr. between 1860-1885. It has remained in Terrell family hands and is fairly well preserved. It holds many heirlooms from the Antebellum years, to include “foot wide” heart-of-pine wood walls that echo memories of the Marion Court between the 1820’s and 1860’s. The greater significance of the building is defined by its use in part as the Marion Court House between the 1820’s and 1860’s, before Judge Terrell bought the olden Court House and remodeled it for his home. Court House benches dating from some of the earliest sessions of the Marion Court yet remain in the home; this alone should attract more substantive interest than curiosity. Indeed, a tomb to several unknown soldiers of the War of 1812 stands one mile South of Pikeville on an original portion of Jackson’s Military Road still in use today. Pikeville should be visited by all interested in Marion County history. Another very historical and revered region of the Marion landscape already mentioned in part is the Military Ford-Toll Gate community. 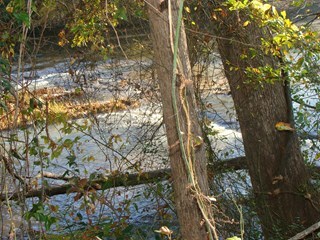 The Military Ford (now within the city limits of Hamilton) was the auspicious site where Jackson’s Military Road crossed the Buttahatchee River, focal stream of the county. The first Marion Court in present day Alabama had also been held here in 1821. But then, a Toll Gate was placed on the Military Road less than one mile north of the Ford in 1822-23. And, this Toll Gate and its collection house on a revitalized Military Road Turnpike became the focal point of an evolving community in the 1820’s, which was called, “Toll Gate”. This Toll Gate community soon absorbed the Military Ford neighborhood bringing a post office to be established there in 1838. It remained through 1882, when its name was changed to Hamilton Post Office to reflect the new court town being built that year one mile north of the older Toll Gate location. Initially, the Toll Gate on the Military Road Turnpike was established just south of the rear entrance to today’s Econo Lodge Inn. It gave rise to an intersection there with another historical road, the road to Cotton Gin Port, the first Marion County Seat on the Tombigbee River. The Gin Port Road ran westward from the Toll Gate, intersecting the Military Road at that point. The Gin Port Road would become the Aberdeen Road over the years as new port towns were built on the Tombigbee. 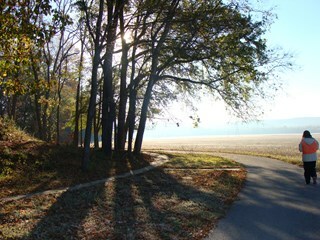 This road also provided a connection to a road to East Port on the Tennessee River. Thus, the early Toll Gate community evolved around roads, commerce and toll charges as county crops and livestock were shipped out the locality to the Tennessee and Tombigbee River ports and international trade. The Military Road itself provided good connections with the port of Florence on the Tennessee River, and the port of Columbus on the Tombigbee. The Toll Gate community became a dynamic locality in the county. Therefore, when Pikeville lost its central location and its viability as the Court Town of Marion in the 1870’s the Toll Gate community was elected in 1881 to be the next county seat. 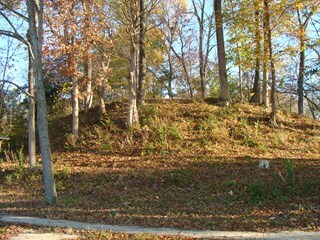 By the 1880’s it not only held a post office, a central county location, and the Military Ford and its giant Indian Mounds; but one of those mounds held the grave of the founding Territorial Judge, John D. Terrell, Sr. 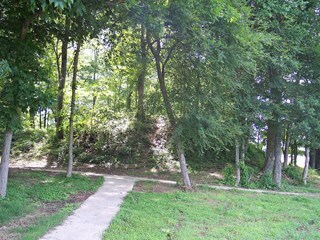 The Judge’s home at the Ford had overlooked the Mounds; and he had elected to be buried sitting up with several belongings, Indian style, among Indian graves on the mounds. Judge Terrell, Sr., had served many years as an Indian Agent and had been a personal friend of the Chickasaw Chiefs for decades. His colorful burial in the Toll Gate-Military Ford community had certainly spoken well for the site in its campaign for county seat. Notably, Toll Gate was voted to be county seat on the basis of the Toll Gate site or the nearest suitable place. And, some fortuitous planning by the granddaughter of Judge Terrell, Sr., and her husband Albert J. Hamilton, enabled those two to offer the county 40 acres in 1881 for a court town about a mile north of the Toll Gate-Military Ford. 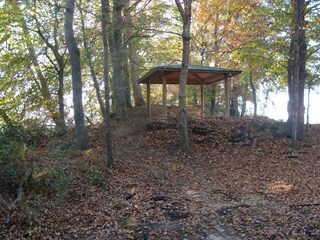 The acreage was approximately where downtown Hamilton, Alabama stands today, and the offer was accepted by the county. A new court was built there in 1883. Information courtesy of the Marion County Historical Society – “AN ABBREVIATED HISTORY OF MARION COUNTY ALABAMA” By: The Marion County Historical and Genealogical Societies.